Primark and I have a funny relationship. I often see friends or bloggers proudly displaying their Primark purchases but on entering the store I rarely find anything I like the look of and generally run out as quickly as possible away from the hoards of people fighting over the latest bargains. That said as you know I'd been lusting over a floral crown I'd seen so a couple of Saturdays ago I took the decision to be at my local store as the door opened giving me the opportunity to have an almost peaceful look around. Whilst overjoyed at having my flowers in hand - which you can see me proudly wearing in this post - there wasn't really much else that took my fancy until I came to the shoes. I'd spotted these sandals in various colours during other visits and always resisted purchasing, thinking I didn't have any reason to wear them but on this occasion feeling like I needed something more in my shopping basket to jump on the Primarni bandwagon I decided to give them a try. Once they were on my feet I was sold. I still didn't really have an occasion for them but come on, they were £12 and we all know I love red and this wasn't just any red but a gorgeous orangey summer red. Happily swinging my Primark bag of treats I decided to have a quick nose in Topshop to see what was around. I always try to have forthcoming events in the back of my mind when shopping so if something appropriate presents itself I have an excuse to get out the debit card. Knowing I had a family BBQ coming up (today in fact) when I saw this dress I wanted to give it a try. I'm not a fan of my legs in flats and wasn't too sure on the dress until I remember my recent Primark sandal purchase - serendipty right there people! I popped the sandals on and sale number 2 was made. During a major drugstore haul this week (it's payday week!!) I picked up a couple of nail colours which will work perfectly with this dress; which one to chose? And even more exciting is I'm off to one of London's braid bars to have my hair plaited this morning. What great finds Victoria! Love them both. I'll be very curious to see your new hairstyle. I takes so much time to have braiding done but is worth the time in the chair for the results. How exciting to be going to London. We get a glimpse of it on TV from time-to-time and through books. What a dream that would be to actually be there. love those shoes, and yep, total serendipity! I'm with you on Primark, have a real love/hate thing with them. Love it when I find something fab and cheap that I really want, hate how much of a jumble sale it turns into by late afternoon, any day of the week. 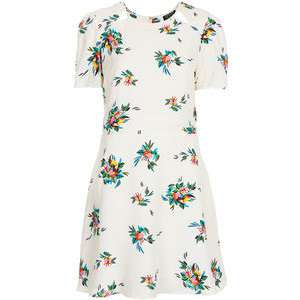 And, I get so frustrated when I see gorgeous things in mag saying 'from Primark' but can I ever find it ? Nah. There is yet another floral hairband that I saw recently, said it was Primarni, could I find it? Nope. Probably in and sold out by late spring! have fun with the braiding! 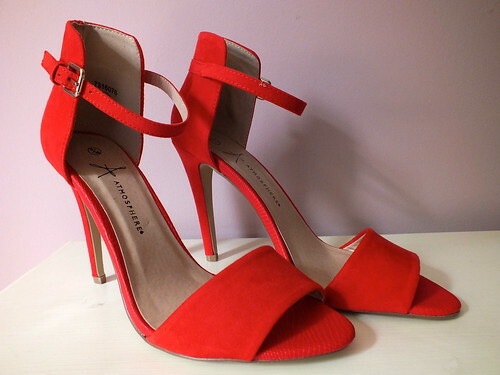 Gorgeous shoes, I always love red shoes, any shade of red! Im sure i saw these shoes in primark the other day and got far too excited?! how exciting that they're from primark. Im the same though, I love it or hate it... it really does depend. Loveeeely items. very jealous. gonna go buy these heels!